The M.O.M Method | i2a Solutions Inc. 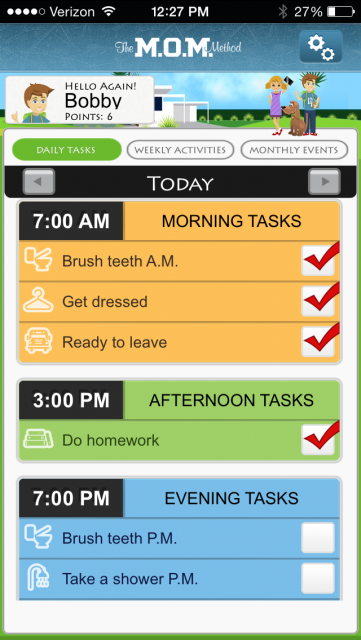 Create an interactive website, iPhone and iPad application to teach children how to learn how to maintain a schedule and complete tasks. We developed a website from the ground-up that has the sophistication parents want, but is easy enough for children to use. This required creating a kid-friendly user interface where children could track daily accomplishments such as brushing their teeth or putting away their clothes. To incorporate the needs of a rewards-based system kids receive points for each completed task. The initial reward structure is points-based, but we built the system to be scalable so as the site matures it could include additional types of rewards such as prizes. Parents can create accounts for kids and add a personal photo to represent the child in the system or select a cartoon-friendly avatar. Once an account is created parents can set up schedules and tasks from pre-populated lists or add their own options. 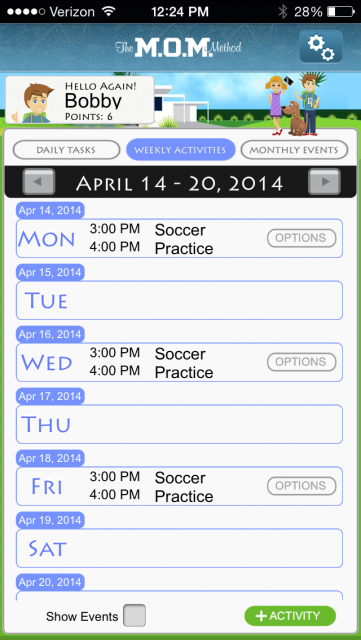 Kids can monitor the site or mobile app daily and check off tasks as they are completed. We also provided reporting tools for parents and even a blog where they can learn more about child behavior, dealing with stress, get advice, and find tips on how to use the website.